The slow motion dance that is cleaning and clearing my life is starting. As bits work their way to the top of my consciousness, I'm assessing their usefulness and whether they really are things I want to keep. As this will be a long-term project, it kind of feels like a Schubert waltz, recorded at 78 and played at 33. Baby steps. I'm also telling myself that until the bag goes out the door for donations or the box with the stuff leaves my paws at the post, no decision is final and it's okay to have the "Ooooh, do I really want to do that" feeling. Clothing is one area I really need to take a scythe to. I washed all but one pair of dark pants on Monday night. That was 11 pair hanging to dry in the basement. Every single pair of dark colored pants was in the wash and I was wearing the olive green twill pair. This doesn't happen very often, that every pair is in the wash. It's the culmination of two road trips and being too worn out to do wash in between or after them. I have four pair of tan pants so there were pants for work. I hung these up to dry and contemplated why I need so many. When all my pants are clean, which only happens one or two weekends in the summer, they don't fit real well in the drawer. Yet, when I'm exhausted and the thought of needing to have pants washed is almost overwhelming, I'm glad I can go 2 weeks without having to wash pants. Shirts, on the other hand...This is where the clearing, the paring, the emptying of the closet is going to begin. I have too many. While I had to wash pants, I didn't have to wash shirts. I wouldn't have to wash shirts for a couple of months, even accounting for a clean one every day. I can wear tee-shirts to work since I don't go out in the field that much and I have plain tees that look nice. But, honestly, if I step back and look at the closet, I simply have too much. So, this is where the pruning begins. 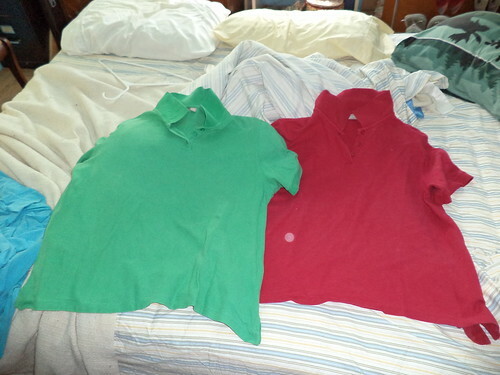 Take these two polo shirts. I've had them for a very long time. There is still substantial life in them. Why are they going away? Well, my taste in shirts has changed as I've aged. These are women's polos and they are not long enough in either the sleeve length or general shirt length for my taste. I look at them and think, 'When I lose this weight...', but I catch myself. The whole weight loss thing is going to be a long slog. I need to get myself a pair of good walking shoes, something that cushions my toes. My current pair of athletic shoes does not provide support for the kind of walking I want to do. Right now, I'm only at 'leisurely stroll' not 'fitness walking'. While I have to work up to that, I want good shoes that support me. I look at these shirts and I think of what could be and what used to be. I've had these for a long time. I got my money's worth out of them. But they don't fit who I am at this point in time. If I am true to my desire to divest, reduce and pare down, I have to be honest that I'm uncomfortable wearing them and they need to go into the give away bag. If I was so inclined to have a garage sale, I probably could get a couple bucks for them, but a garage sale is too much work. And so it begins. With the weather nice and warm now, I'm thinking it's a good time to assess my sweater "collection". I was desperately looking for some updates in athletic polo shirts .Polos are a staple in any man's wardrobe. They are versatile and light, and can be dressed up or down according to the occasion.